Prophet's Chamber - At Zion Baptist Fellowship Church, God's Will Is Our Desire For You ! 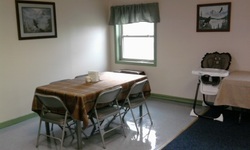 This common area is situated between the rooms. It includes aTV with DVD and VHS players, as well as game hook-ups. It is a good place to spread out and relax. A very light and spacious room. Plenty of room for a portable crib ( if you have a baby). It has its own entrance to a bathroom with a shower. 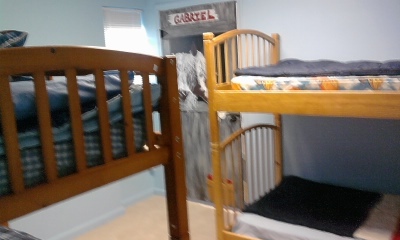 Equipped with two bunk beds, this room will easily sleep 4 adults or children. It has a pocket door which gives access to the bathroom located between " Carol's Corner " and the " Bunkhouse " room. 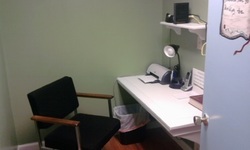 We provide this room as a place for secluded study time or to make phone calls. There is a direct hook-up to the internet here as well as a strong wireless connection on our encrypted router. 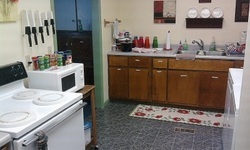 We have a kitchen that includes a refrigerator, freezer, stove, utensils, washer and dryer. We do keep food and supplies stocked for our missionary friends use, however, if you are planning an extended stay (more than two weeks) we ask that you give some consideration to supplying your own food items. We have three rooms available as well as cots and a hide away bed for larger groups. To check availability click here. or submit a request for use click here.